A pressure gauge is a device which measures the pressure in a gas or liquid. Pressure gauges are widely used all over the world in industrial environments because of its affordable price. These Pressure sensors are among the most often used instruments in a plant. But because of their great numbers, attention to maintenance can be compromised. As a consequence, it is not uncommon in older plants to see many gauges out of service. This is unfortunate because, if a plant is operated with a failed pressure switch, the safety of the plant may be compromised. Conversely, if a plant can operate safely while a gauge is defective, it shows that the gauge was not needed in the first place. Therefore, one goal of good process instrumentation design is to install fewer but more useful and more reliable pressure gauges. One way to reduce the number of gauges in a plant is to stop installing them on the basis of habit (such as placing a pressure gauge on the discharge of every pump). Instead, review the need for each device individually. During the review one should ask: "What will I do with the reading of this gauge?" and install one only if there is a logical answer to the question. If a air pressure gauge only indicates that a pump is running, it is not needed, since one can hear and see that. If the gauge indicates the pressure (or pressure drop) in the process, that information is valuable only if one can do something about it (like cleaning a filter); otherwise it is useless. If one approaches the specification of pressure gauges with this mentality, the number of gauges used will be reduced. If a plant uses fewer, better gauges, reliability will increase. Two common reasons for gauge failure are pipe vibration and water condensation, which in colder climates can freeze and damage the pressure gauge housing. The delicate links, pivots, and pinions of a traditional gauge are sensitive to both condensation and vibration. The life of the filled pressure gauge is longer, not only because it has fewer moving parts, but because its housing is filled with a viscous oil. This oil filling is beneficial not only because it dampens pointer vibration, but also because it leaves no room for humid ambient air to enter. As a result, water cannot condense and accumulate. The high reliability of the OMEGA™ range of pressure gauges is chiefly attributed to the unique OMEGA™ Spring Suspended Movement. The entire movement is suspended between two springs, the Bourdon tube above and the link below. Wearing parts have been reduced to a minimum. Furthermore, these movement parts are ultrasonically cleaned and lubricated with silicone oil to ensure long cycle life. Sustained accuracy and excellent readability are important user features of the OMEGA™ General Service Gauge line. 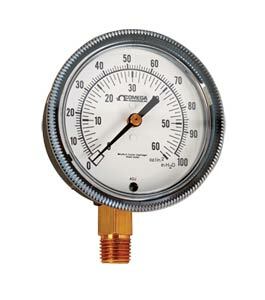 Meeting the requirements of many industrial applications, General Service Gauges can be used on steam boilers or other pressurized vessels; on pumps and compressors; on many types of industrial machinery; in the chemical, petrochemical and allied process industries; in power plants; in pulp and paper mills. The pressure gauge actuation system in the OMEGA™ General Service Gauge line is the standard 316 SS Bourdon tube system, which is engineered to precise tolerances for consistent repeatability and response to pressure fluctuations. OMEGA's PGM series gauges are suitable for corrosive environments in chemical, petro-chemical, refining, power, marine and food and pharmaceutical processing applications. The PGM series comes in a 63 mm (21.2") or 100 mm (4") case, features all stainless steel construction and is environmentally protected to IP65. The PGM series can also be liquid filled in the field. Liquid filled pressure gauges provide users with a number of advantages in certain applications. They are ideally suited for uses on equipment where excessive vibration and pulsation are encountered such as pumps, compressors and machine tools etc. The liquid fill minimizes the effect of these severe environments, protects the pressure gauge internals and provides continuous lubrication in the mechanism, all adding up to extended service life. Liquid filling provides greater protection of the gauge internals from corrosive atmospheres. Gauges can be filled with a variety of fluids including glycerin, mineral oil and silicone oil. These gauges are a very popular style for the factory floor. Thousands are installed world wide to monitor process pressures. Available in vacuum pressum gauges, compound and ranges up to 20,000 psi (1380 bar). A hermetic seal provides greater protection and efficiency. Highly accurate pressure gauges designed for use in instrument shops, plants of all types, and laboratories throughout industry. They provide sustained accuracy to 0.25% full scale for most models. Performance, reliability and precision measurement are coupled with consistent accuracy in meeting the demanding service needs of numerous test gauge applications. These gauges are often used as master reference gauges, in test stand measurements, for production inspection, and for verifying the accuracy of general service gauges. They have a stainless steel mirror ring for pointer reflection to prevent parallax error. This mirror surface reflects the pointer in any position and allows the gauge to be read with great accuracy. Differential pressure gauges are rugged industrial sensors which indicate the difference between two input connections. Differential ranges provide the maximum resolution for applications where one input is always at a higher pressure than the other. In cases where one input can be higher or lower than the other, a bi-directional differential range should be used. The OMEGA PGD Series is constructed with two independent Bourdon tubes. The opposing Bourdon tubes are linked to a single pinion gear which rotates a pointer for direct pressure readings. By using two independent Bourdon tubes, the gauge can handle liquids or gases on either or both ports. OMEGA's PGUF series liquid fillable utility gauges are designed for a wide range of applications on pumps, compressors, hydraulic systems, machine tools and petrochemical processing equipment. For high shock and vibration applications the PGUF can be liquid filled in the field to dampen the gauge pointer movement. Gauges feature a corrosion resistant 304 stainless steel case and ring, and a durable polycarbonate window. The most obvious gauge accessory is a shutoff valve between it and the process, which allows blocking while removing or performing maintenance. A second valve is often added for one of two reasons: draining of condensate in vapor service (such as steam), or, for higher accuracy applications, to allow calibration against an external pressure source. 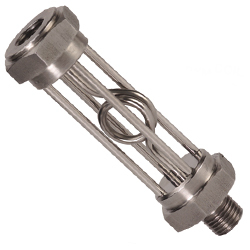 Other accessories include pipe coils or siphons, which in steam service protect the gauge from temperature damage, and snubbers or pulsation dampeners, which can both absorb pressure shocks and average out pressure fluctuations. If freeze protection is needed, the presssure gauge should be heated by steam or electric tracing. Chemical seals protect the gauge from plugging up in viscous or slurry service, and prevent corrosive, noxious or poisonous process materials from reaching the sensor. They also keep the process fluid from freezing or gelling in a dead-ended sensor cavity. The seal protects the gauge by placing a diaphragm between the process and the gauge. The cavity between the gauge and the diaphragm is filled with a stable, low thermal expansion, low viscosity and non-corrosive fluid. For high temperature applications, a sodium-potassium eutectic often is used; at ambient temperatures, a mixture of glycerine and water; and at low temperatures, ethyl alcohol, toluene, or silicon oil.